The Japanese quail has an interesting mating strategy: the females prefer to mate with the losers of fights. Or do they? A new scientific paper on the topic makes me want to set up a quail fighting ring to find out for sure. Generally, when two males fight in order to mate, it's the winner who walks off with the female. The Japanese quail bucks the trend. 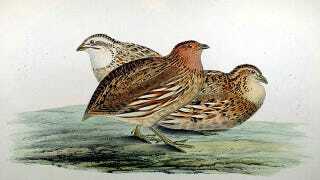 According to one paper, the female quails tend to choose the loser in any given fight. Maybe. The paper is liberal in its definition of the "loser." It has good reasons. There are ethical concerns about forcing two quails to violently fight each other. Instead of putting the two male quails in one cage, they're both put in a cage that's split into two segments by a clear plexiglass barrier. The male quails were put on either side of the barrier. Whichever male pecked the plexiglass the most was considered the winner. Watching all of this from behind plexiglass of her own was a female quail. As soon as all three were put in a cage together, the female was much more likely to hang out with the loser of the fight. Females who hadn't witnessed the fights showed no preference for either winners or losers when they were all thrown together. There's a reason why the female preferred the loser of these fights. After arranging another round of fights, the researchers gave the female birds and each of the male birds quality one-on-one time until they mated. While both the winner and loser males preened and otherwise courted the females, the winner males were much more likely to peck the females, pull their feathers, drag them across the floor, or engage in "single-foot mounts" which I can't entirely picture, but apparently good for female quails. So winner males are more likely to be aggressive to both males and females, and the females recognize that. But the winners didn't technically win a fight. The researchers acknowledge this, and do the best to cover all the angles without engaging in animal abuse, but I still want more. I wish there were a way to establish ethical quail fights. Maybe the less aggressive males would win in the end. Maybe they contain inner discipline that outshines rage, like the karate kid, or that old monk in a cloak who appears at the start of every anime. Maybe the females know something we don't. Read the full paper: Female Quails That Eavesdrop on Fighting Males Prefer Losers to Winners. Then let me know who's game for setting up a quail fight.